Cliff, a 14 year old boy living on the family farm in Southwestern Colorado, is badly beaten by a seventh grade bully on Monday of the last week of school. Cliff is the only eighth grader in the one room school. It is 1955. The farm and school are located eight miles from the entrance to Mesa Verde Ntl. Park. Cliff goes home and takes his .22 rifle to the road to wait for his bully and friends to come home. He has every intent to kill the boy who has bullied him for the past few years. While waiting he begins to think of the effect this action will have on his own family and the family of his bully as well as his own future. Instead of killing Hector, he gathers a few meager items into a gunny sack and runs to a cave a mile and a half away from his home and hides. He has found the cave and intact cliff dwelling while looking for bee trees in the canyon the summer before. It is well concealed. Access is difficult. During a week of hunting for him, no one finds him. When he to return home, he sees neighbors helping his dad doing the spring planting. Among them are Hector and Hector's Dad. He feels betrayed by his own dad that the very ones who have been the cause of his running away have now replaced him. In his Dad's eyes Cliff isn't even needed. Cliff turns away and returns to the Cave. He begins in earnest to see if he can survive there. He decides that if he can not. No one will care one way or the other. His feeling of self-worth can go no lower. 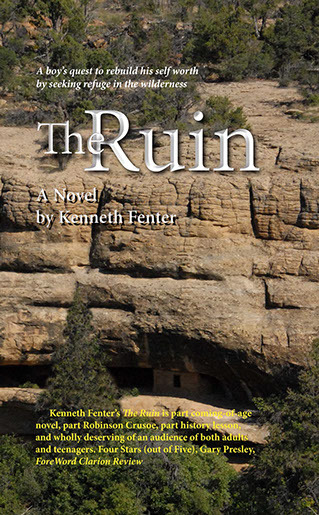 In following days, weeks, and months, Cliff learns that knowledge of farming, crafts, and observations at Mesa Verde can help him prepare for the long savage winter at the high altitude in the Colorado Rockies foothills where the cliff dwelling is located.